DAYDREAMING | STEP BEHIND MY SCREEN OF STORIES. The inner voice where gaps of expression are liberated. When I watch my wild birds, I daydream of their freedom, and how free I was when I was eighteen. When I listen to Wes Montgomery I dream of Brazil, and riding on a float at Mardi Gras, just once, with a feather hat, and dressed like Rita Hayworth. When I sit at my desk and look at my mother’s photograph, I dream of those few luncheons in the formal Garden Room on the top floor of Bullocks Westwood, watching the fashion show with her, proud of my model mother, and imitating how she ate the tuna salad. When I lay in bed at night, I dream of him, and his strong shoulder cupping my head, watching an old Cagney movie. When I shovel snow I dream of Southern California, of old Del Mar and sitting on the bench under the crooked tree, in a triangular postcard of the crashing surf, prancing dogs, and the meter maid marking the curb. 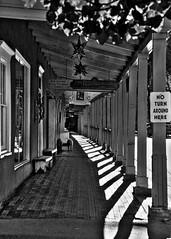 When I walk along Palace Avenue in Santa Fe, New Mexico I dream of walking 5th Avenue at about 6 pm, when everyone pours on to the Avenues, a fountain of limbs and accessories crisscrossing patterns of human tolerance. Day dreaming unlike night dreaming that takes us on the back of fairy tales and science fiction battling some inner masked trauma, illuminates where we want to be, what we need to do, and intercepts the embroidery of our life. The medicine of daydreaming surpasses self-help books, health food, vitamins, yoga, religion, or mind altering experiences. It is the essence of our rising emancipation from complacency. Hi ! – below , found the mention of Westwood/Bullocks -Perfect ! come by the spa tomorrow for a little gift 🙂 !!! Ok, alright…..you win…..I believe this post is the best I have read, ever. My compliments to you. What a great read. Something to truly dream upon. You have what it takes writer.